You see a lot of interesting things when you cast your eyes skyward. I had often been tempted to take a photo of this awesome statue/sculpture, but I had no idea how to shoot it so that it'd be interesting. 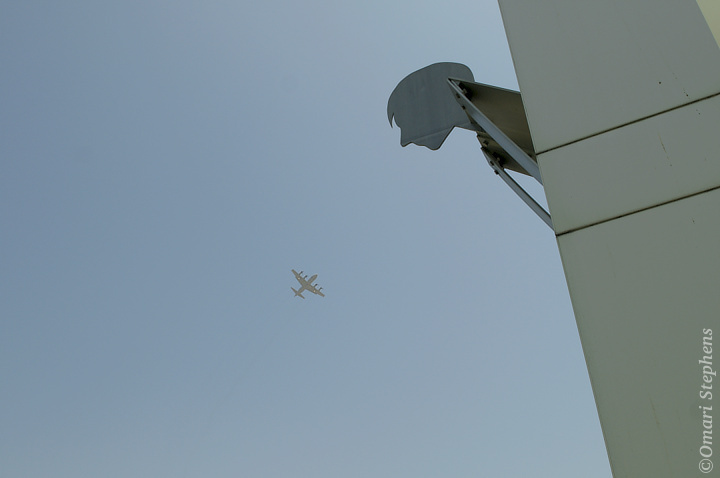 Then walking back from lunch a few weeks ago, I heard aircraft engines. I pulled my camera out and took a couple shots. It was a weird-looking aircraft (later identified as a P-3 Orion, a number of which were apparently stationed at Moffett field), but the photos weren't really that interesting. By that point, I was in the mood for photography and was in the vicinity of the sculpture. I walked over and was pondering what to with it when I heard more engines. With a few quick steps back, I took a couple shots and got this frame. This past weekend, I flew back to MIT for the prom vault, which was amazing. 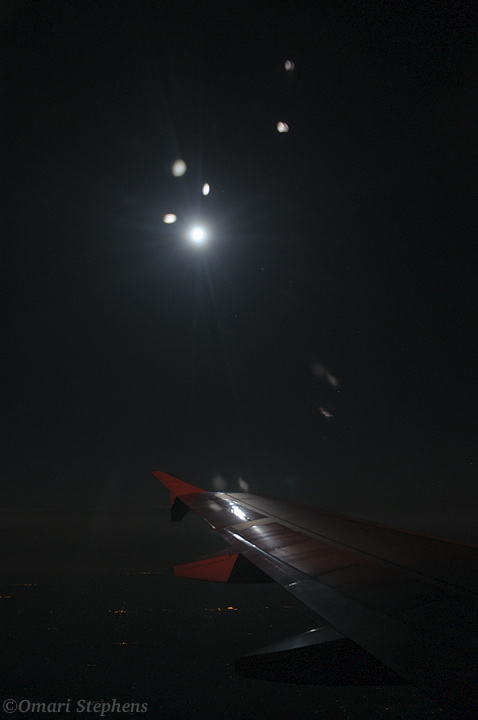 On Sunday night's return flight, I noticed the moon's bright reflection off of the port-side wing, something I had never seen before. I had to wait for the people in my row to turn their lights off and go to sleep, and the person sitting between me and the window graciously turned her TV off. I took a bunch of shots, but they weren't quite right — part of the window was diffusing the light from the moon. Then, when she got up for a moment, I took a few quick shots and got this one. The bright spots are from reflections between the internal and external windows. It had also been a few months since I spotted this bell on El Camino Real. There's no light inside of it or anything, so I figured it would probably look most interesting at night, likely with the moon somewhere in the frame. At the time, the moon had risen, but was hiding behind a nearby building. Riding home tonight, I noticed that the moon was fairly high in the sky and this bell came immediately to mind. I stopped, sat around trying compositions for 15 minutes, and came up with this one, which I really like. The reddish light in the lower-left corner is a really cool lens flare effect from having a streetlamp just outside of the lens's field of view. 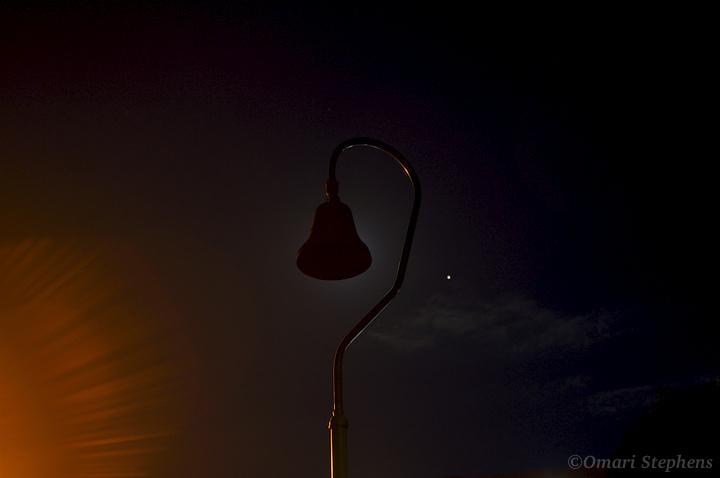 The moon provides the slight blue glow from behind the bell, and I'm pretty sure the bright spot on the right is Venus. "We are all of us in the gutter, but some of us are looking at the stars." The bell is fantastic. I have a similar Ship's Bell (that I used to live next-door to) series of pictures with moon and sunset behind it. Always a good reflection of some sort with such beautiful, shiny metal!